The Enterprise follows a distress signal to a dangerously damaged ship. It belongs to an alien race who look human besides head-ridges and whose name begins with 'T' and ends with 'ian', making them indistinguishable from most of the other alien races whose names I haven't bothered to remember. Seriously, paint them an unusual colour or something! There is no visual hook for me to describe them by. Anyway these boring-looking aliens used to be enemies and this exact set up was often a trap. Despite this an away team including the First Officer, the Chief of Medicine and the Chief of Security beams over. They find 5 youths suffering injuries from an engine malfunction and beam them straight to sickbay. Turns out one of the youths is a human teenager. The boy is called Jono and believes he's a boring-looking alien when in fact he's a human. He won't respond to Crusher or Troi and only settles down when Picard arrives. 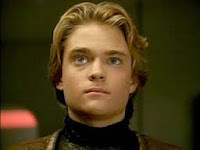 It turns out Jono is Jeremiah Rosa, son of two colonists who were killed during an attack by the boring-looking aliens. His grandmother is an Admiral. Crusher notices injuries in the last few years and fears he might have been subject to abuse. Everyone agrees that Jono should be taken by Star Fleet and returned to human society. Troi tells Picard to bond with the kid and he reluctantly agrees, eventually letting Jono stay in his quarters. A boring-looking alien warship arrives to collect the youths, Picard sends the 4 over but says they're keeping Jono. The boring-looking alien Captain says that Jono is his son. Everyone decides this can't be right because apparently mixed families aren't a recognised thing. 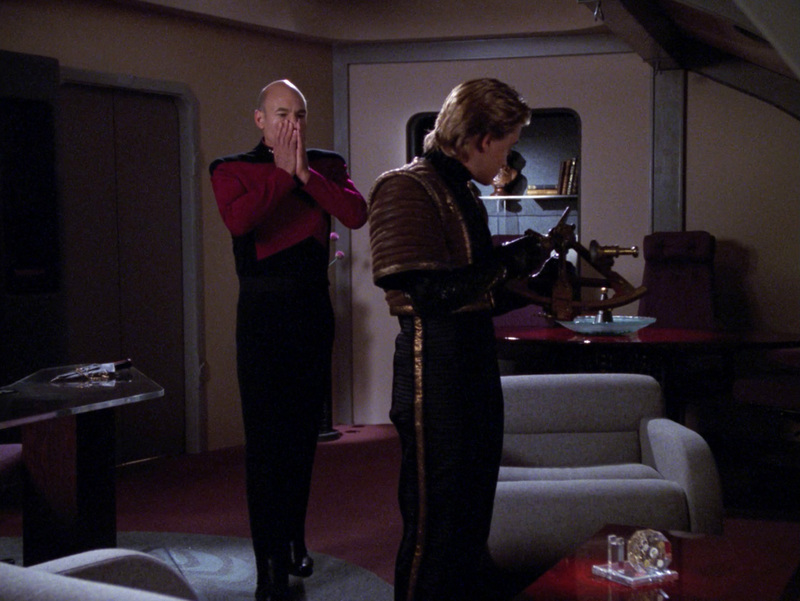 Picard stalls, Crusher suggests caution and Jono is allowed a supervised visit with his father. He says that the injuries are a natural part of being a young man in the competitive environment of the boring-looking aliens. The senior crew continue to do all they can to convince Jono that he is human and humanity is great. Telling him about his dead parents makes Jono experience distressing flashbacks. Receiving a message from Admiral Grandma doesn't convince Jono. 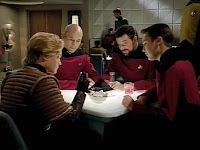 Picard bonds with him over sport then they meet up with Riker and Wesley. Jono laughs when Wesley gets ice cream in his face. They think they're close to convincing him. That night Jono stabs Picard in the chest. The boring-looking aliens send more warships and the Captain demands the return of his son or war will resume. Riker tells boring-looking alien Captain that Jono is in custody. Picard, who is soon patched up, asks Jono why he did it. Jono is deeply conflicted; when he had fun with the humans he thought he was betraying his father and his culture. He attacked Picard so he would be put to death. Picard recovers enough to go to the Bridge just as the Enterprise is facing off against warships. He tells boring-looking alien Captain that they were wrong to ignore Jono's feelings. He will be sent back to his home and his father. Picard is in full 'get off my lawn you kids' mode at the start of the episode, shouting at the youths to be quiet. The cacophony they were making was actually a tradition of their people and I suspect that if they'd been adults Picard might have been more diplomatic about shutting them up. He is aghast when Troi suggests that he should try bonding with Jono, but accepts that the kid's disdain towards women prevents Troi from doing it. This seems like precisely the sort of thing he told Riker to deal with when they first met. I'm not sure why Picard let Jono stay in this quarters, except perhaps that he wasn't sure what else to do. I think he regrets it very quickly when Jono starts touching his things and playing loud music that isn't to Picard's taste (again not a youth thing but a cultural thing). Picard's awkward speech to Troi is hilariously unconvincing suggesting either that his speeching powers only work when he's being spontaneous or that Troi is immune to them and we're seeing the scene from her point of view. 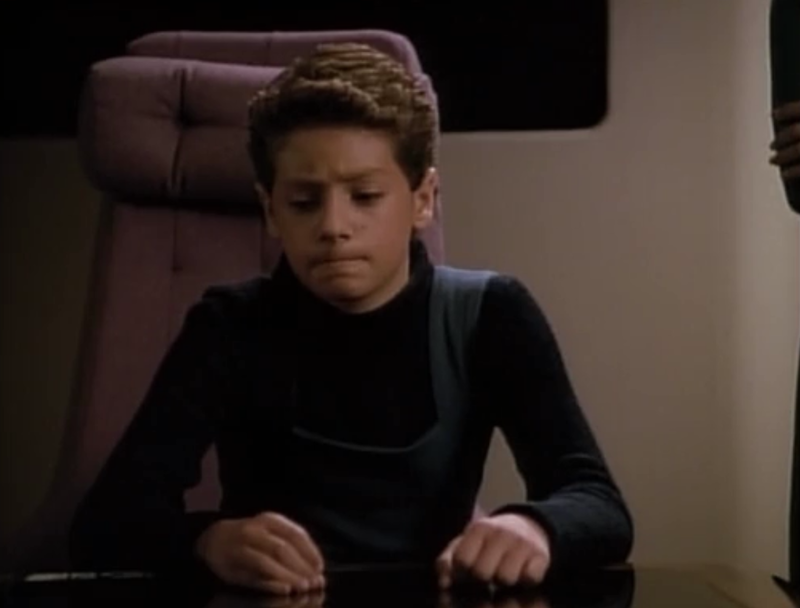 She asks him about his own childhood and it sounds like he didn't interact with other children much then, being too focused on his aim of being a Star Fleet Captain. Having seen his family home 2 episodes ago one wonders whether that was the furthest thing he could imagine from being a Luddite vineyard owner, as his father must have been. Later in the episode Picard moves from 'get off my lawn you kids' to 'understanding mentor' via 'diffident uncle'. Seeing that Jono is having strong feelings, and deciding he doesn't want to deal with them, Picard introduces Jono to the traditionally acceptable outlet for male emotion that is sports. (I assume, I'm neither male nor into sports so this assumption is based entirely on observation.) He bonds with Jono over a game of future-racquet ball (is racquet ball basically squash?) and then takes him to 10 Forward where they sit with Riker and Wesley in an obviously contrived and very weird male-bonding double date. All is proceeded as planned, until the kid stabs Picard in his sleep. At least at the end Picard realises what had been obvious all along: that he and his crew had unthinkingly taken a child from his family and his culture. They decided they knew what was best for the kid, plotted to coerce him into their way of thinking and acted as though it was all in the child's best interest. The show doesn't draw any explicit parallels (the kid is blonde and his father is a pinkish boring-looking-alien), but this is something that haunts human history and affects societies even today. Picard's realisation is not accompanied by an apology. I'm not sure how Crusher knows Jono's name when she also says he won't talk to anyone, but that's a minor niggle. It's quickly apparent that the patriarchal society Jono comes from means he (and presumably those other kids) won't take Crusher seriously. She can't like that but her focus is ensuring they're healthy so she doesn't let it stop her working. Her analysis of Jono shows old injuries and she's the one who brings up the possibility of abuse. I wonder how different this episode would have gone without the abuse concern, we're meant to think that the kid is being saved, tricked out of looking for moral grey areas. Worf interacts with Jono only briefly. Jono assumes the humans have captured Worf too, and is surprised to find that Worf is there willingly and taking orders from a woman. The boy claims he's no more human than Worf is, and Worf tells him he's confused. It's sort of a nice moment, but then Worf is barely in the episode again. It's a shame because the parallels between Worf and Jono are many and obvious. Jono's origin is practically the same as Worf's and whenever the crew were discussing the situation I wondered whether someone would ask Worf his opinion, or whether Worf would speak up with his own thoughts on this situation that is basically his life! I guess they didn't want to actually explore the ambiguity of the situation during the episode or it would have robbed Picard of his big realisation at the end. I did consider that boring-looking-alien Captain taking little Jono was very similar to Sergey Rozhenko taking baby Worf, the only difference being that the Rozhenko was a third party in the conflict whereas the Captain was a combatant and did it according to his own customs. No better way to make a character seem unreasonable or suspect than by giving them unfamiliar customs (I know this isn't the point of Trek, but I still think it happens). Did the Rozhenkos contact Star Fleet or the Klingon Empire about finding Worf's family or returning him to Klingon society? 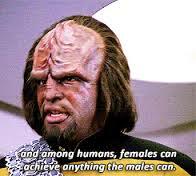 I know Worf's supposed to be the last of his family (except his secret brother, shhh), but there must be maternal relatives or distant cousins who could have taken him in. I know family (presumably of the biological kind) is important to Klingons, but equally a warrior culture which is big on feuds must have societal provisions for orphans. His secret brother (shhh) was raised by family friends so it's not like blood is everything. Troi's role is a bit mixed here. She's the one who suggests building trust with Jono and introducing him gradually to human culture, rather than snatching him away from the only home he can remember. That said she also seems to be all for taking him away away from the boring-looking-aliens eventually. She's from a mixed family, her background is more peaceful than Jono's (and Worf's) but you'd think she'd understand the benefits of a child being part of two cultures. Can't she tell that leaving his home is not what Jono wants? Also, can't she tell whether Jono has experienced abuse. Even if he doesn't think of it as out of the ordinary, surely she could sense if he was afraid of his father? Again this is the kind of exploration that would rob Picard of his epiphany, so we don't get to see it. The whole anti-women thing gets Troi out of the way so Picard is forced to step in. It also means we aren't sympathetic with the boring-looking-aliens. Troi's insistence that Picard take responsibility for Jono has some amusing outcomes, and we hear about Picard's odd, lonely childhood. Troi's the one who compares dealing with Jono to parenting, not something Picard's ever shown much interest in. I don't think it would have been difficult to get someone else to care for the boy, but I think Troi wanted to shake up Picard's routine a bit. After all she's up on the Bridge helping him out with stuff all the time, probably wanted some time to actually counsel people. 1. Jono's DNA reveals that he is Jeremiah Rossa, grandson to an Admiral whose other relatives have all died in conflict. Troi advises Jono must connect with humans in general before he could possibly be returned to his family and assigns it to Picard as he's male and the only person Jono has listened to so far. 2. Picard tries to convince Troi that he shouldn't take responsibility for Jono because he's not good with children and never has been (even when he was one). Troi encourages him but is clearly in her role as Counsellor (as opposed to being his PA) because she doesn't give him the option to refuse. 3. Crusher, Picard and Troi discuss whether Jono should see his father, what is best for his emotional health and trust building with humans, and what is most diplomatic seeing as they're in boring-looking-alien territory. Meeting Addendum: Troi and Picard are supposed to be supervising Jono's meeting with his father, just in case there is abuse. Crusher points out that abusers can have subtle influence on their victims, which is valid. So Troi and Picard stand at the opposite end of the room and stare at the wall, supervising nothing. While I appreciate that having them hover over things would have been dramatically a bad choice this doesn't really feel like a supervised encounter. I guess Troi would've said if she's sensed anything bad, though she doesn't tell anyone she sensed good stuff either. Won't Somebody Think of the... Oh wait, that's kind of the point. An example of how thinking about the children can still mean things go wrong. Everyone involved believes they are acting in Jono's best interests, but they are blinded by their arrogant assumption that their way is the right/only way. The concern about abuse is valid and so caution makes sense, but that doesn't entitle them to try and manipulate the kid either. Telling him the truth about his origins is fair, but that doesn't mean they should necessarily bring Admiral Grandmother into the situation before Jono's made a decision about his future. The episode doesn't resolve how Jono will cope with his resurfacing memories; what will happen with his much-bereaved grandmother (does he have her number? could they exchange emails for a while? ); whether Jono will decide to explore his human background, and whether he will be allowed to. It's important stuff but outside the scope of this episode. Jono says goodbye to Picard and finally takes his gloves off, allowing himself a touch an 'alien', acknowledging Picard as like him. He also touches forehead with Picard, a custom of the boring-looking aliens, whose culture he's still part of. More Brent for your buck. 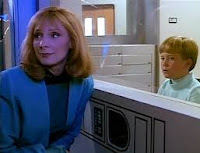 A child is told off by Riker. While his parents were absent he played on prank on his little brother, Enterprise rushes him to a medical facility. He is unsurprisingly reluctant to forgive his brother. 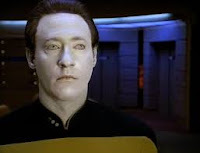 Data stops talking mid-sentence, twitches a little, goes to the Bridge and blankly commandeers the Enterprise. He gets everyone else off the Bridge by shutting off the life support, impersonates Picard's voice to access command functions and cuts the rest of the ship off from the Computer. Down in Engineering Geordi and Picard don't know what's happening or where they're now going, all they can do is deactivate the transporters. When the Enterprise gets to where Data is going he sets up forcefields to follow him to the transporter room, making it impossible for Security to get to him. In the transporter room he traps Riker and O'Brien in a transporter and beams down to a jungle planet. 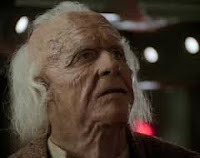 He goes into a cluttered workshop/laboratory and meets an old man who reawakens Data to himself. This is Dr Soong, the scientist who created Data. He was thought to have died on the colony where Data was found, but he escaped before its destruction. He's lived in hiding for years, but kept an eye on Data's exploits. The pair ask about each other and Soong is confused about Data's choice to enter Star Fleet. Then Lore -the android created before Data- arrives unexpectedly. On the Enterprise Geordi uses the quarantine field around the sick child to deactivate the forcefields Data put around the Bridge. They still can't do much and time is running out for the little boy. Geordi suggests they may be able to put the Computer in training mode and use something in the transporter to convince it that they're Data and beam after him to find out what's happening. On the planet Lore is angry at Dr Soong and prepares to storm out, but Soong announces that he's dying. 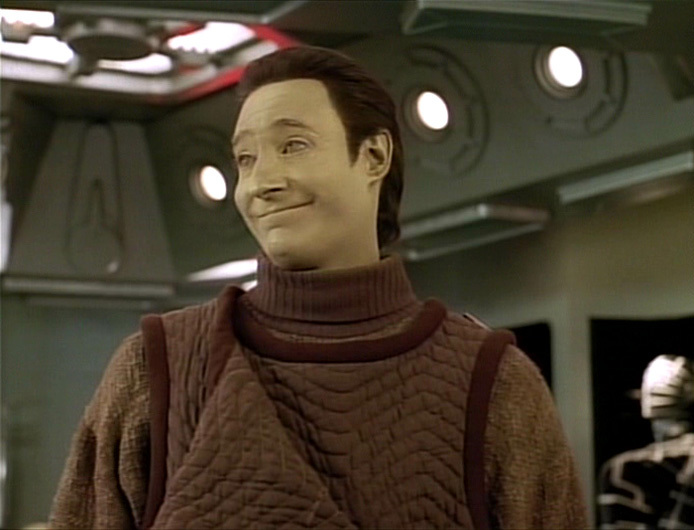 Data warns Soong that Lore can't be trusted, and mentions his murderous tendencies. Soong feels guilty about dismantling Lore and didn't know he'd been reassembled or he'd have helped him. Soong says that Lore is not superior to Data, then reveals an emotion chip he made just for Data so he can integrate better. Lore is resentful and while Soong is napping he deactivates Data and swaps clothes with him. After Soong has installed the chip Lore reveals the switch, attacks Soong then beams away. An away team arrives, reactivates Data and demands to know what's happening. Soong tells Data how to access his suppressed memories and Data apologies for the inconvenience he caused to the Enterprise. Despite the urgent time limit Rker allows Data a moment alone with his father. Data says he cannot mourn him, but he tries to be comforting as Soong dies. Here Riker fulfils the function Picard set him when they first met, of dealing with children so that the Captain doesn't have to. Riker formally reprimands the boy for playing his cruel prank, which does seem to impress the guilty child sufficiently. This is the main background we get about the incident. I wonder how often Riker has to pause his duties to tell off children? I get the impression this is unusual in its seriousness. I know a big part of Data's stated characterisation is that he doesn't have emotions, but as I've said here before, he sort of does. It's more that his emotions are mild and he doesn't acknowledge them as such. This episode gives us a truly emotionless, characterless Data, performing with machine efficiency as he commandeers the Enterprise and goes to Dr Soong. He says and does nothing that isn't entirely necessary to his goal. It's scary that what makes Data an individual can be overridden so completely. This is what makes him non-human, not his failed attempts at understanding humanity. Data's defining personality trait is curiosity and when he encounters Soong he experiences that strongly and asks him questions about his creation. After Lore's arrival Data learns that his brother previously lied about their respective natures. Lore is not superior. It takes Data a few tries to actually process this revelation, seems like a fairly emotional reaction to unexpected parental validation. Data feels concern about Lore attacking Soong, and about Soong making him delay the Enterprise. He tells his dying father that he can't mourn him, again underestimating his own emotional capacity. Though I suppose that if he mourns Soong in the way he mourns Lal he'll never mention him again. Soong expresses curiosity about Data's choices. He wanted Data to go into cybernetics, because why shouldn't your robotic children follow in your footsteps? Data completely fails to mention Lal, even though she's relevant to the conversation. Soong would view her as his granddaughter and an impressive next step in cybernetics (self-replication), even if she didn't last long. I guess they really are never going to mention her again. Soong feels fatherly affection and responsibility towards both Data and Lore, and is greatly regretful that he didn't do more for Lore. He ignores Data's warnings that Lore is dangerous, even though I'd assume that was the reason he dismantled Lore in the first place. Though given his behaviour I suspect Soong leans towards amoral. It seems odd that Soong can't tell them apart, they may be identical but if anyone can tell the difference it should be their father-creator. Soong acknowledges that Data's lack of full emotions is a handicap, which is why he called Data in for an emotion chip upgrade. As Soong is dying he acknowledges that Data will mourn him in his own way, suggesting the old man is more aware of Data's capacity for feeling than Data himself. Lore is sarcastic, angry and mocking, just like in his first appearance. His arrival is unexpected and he's ready to storm out, until he hears his father is dying. This upsets Lore, who quickly goes into denial about it. It is one of the few genuine moments we get from Lore that is free from bitterness. Soong reveals that the androids are identical besides some programming, I guess Lore got all the murdery jerk programming. Lore shows resentment and bitterness towards his father and snaps at Data (though I could see that Data was being irritating). Though he does seem sort of pleased or at least interested in Data getting emotions and suggests Data might be able to understand or forgive him. Despite this he impersonates Data to get what he wants, this time the emotion chip. It's not clear why Lore even wants it, he already has emotions and none of them seem good. I guess he just wants what his brother is getting, a typical sibling response. The chip wasn't made for Lore and Soong is alarmed at what it'll do, but we don't get to see that. Lore has installed a transporter in his thumbnail, which is really useful. 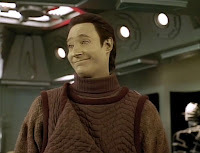 I wonder if Data was more willing to embrace his android nature whether he would get some cool upgrades, like laser eyes or something? Crusher looks after the little quarantined boy. Keeping his spirits up with jokes as well as monitoring him in his isolation unit. Like the other adults she is keen to encourage reconciliation, even though I feel like the younger kid deserves some space for his anger. He speaks eloquently about his situation for one so young, and makes clear that he is not ready to forgive, regardless of whether it suits others that he do so. He's also aware that he might die, which is sad. When the power from the medical quarantine forcefield is used to undo Data's ones Crusher sits with the boy the whole time, even though it's very dangerous. Part of me thinks maybe she should be wearing a bio-hazard suit or spacesuit, but I guess that would worry the kid and her goal is to reassure him despite the danger. Crusher mentions April Fools, which got me wondering do they still have April? Everything seems to be in stardates and you can't really have months in space. Maybe it still happens on Earth. Has this kid ever been to Earth? He seems pretty embedded in the Star Fleet system. Maybe put a firewall on the android. Not the first time it's a problem, won't be the last. Might not have helped in this case as Soong's homing beacon was part of Data's programming and he presumably has the IP address and all the passwords. But still, it's best that people/entities/weird-space-things don't remote-access a senior crew member. 1. Don't let anyone casually shut down life support where there are people. Surely this should need more than a few button pushes? Maybe it should be locked to Captain-only authorisation? Or maybe two senior crew members have to give the order? 2. Voice commands are a security nightmare. 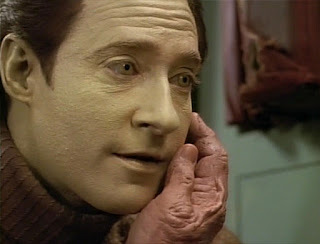 Data convinced the Computer he was Picard by voice alone. Not the first time this has happened either (Wesley in the 2nd episode, though that was only broadcast, not command). Recording devices exist, as do speech simulators, so that's a problem right there. Maybe have something other than/alongside voice control? Especially as you have to say command codes out loud, where people can hear. What's wrong with keying in a code or a biometric scan or something? 3. Crew location detection should be part of security. 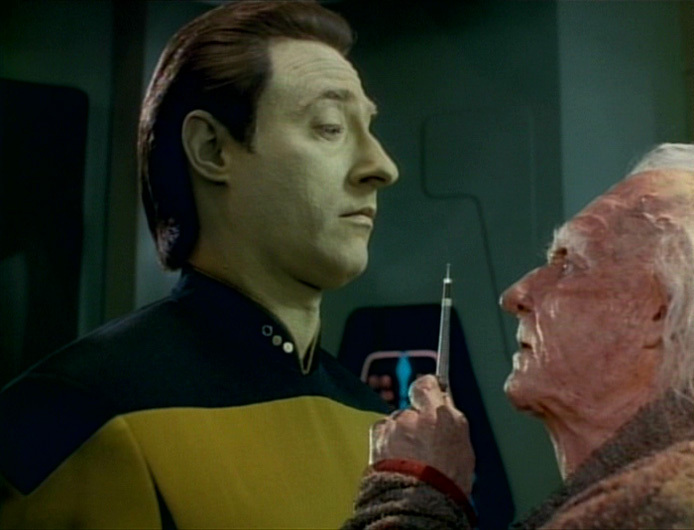 Data was able to impersonate Picard even though the Computer must have known that only Data was on the airless Bridge and Picard was in Engineering. It's not like Data took Picard's comm badge (which would've been a nice touch, though I guess it may not have made any more sense). Surely establishing the location of the Captain should be a key part of any automatic security checks done as part of a high-level command changes? 4. Use the forcefields better. I didn't think the internal forcefields could be used the way Data uses them here, because there have been various times before when that would have been useful and no one did it. I'd assumed that level of security/containment tech was a Deep Space Nine thing. 5. Plan for this stuff. They have to ask the Computer to figure out what stun setting can take out Data. Why not use kill? It's designed for biological creatures and Data can be repaired. In Worf's role shouldn't he have a plan for how to take Data out if it comes to it? I mean it's not a happy thought, but Data is stronger/faster/better than everyone else and obviously poses a threat if he malfunctions. Plus it's not as though they've never had to deal with a homocidal android before (Lore, again). I get the sense that Worf is a fairly reactive security chief, and it's not as though he's allowed to act on his more aggressive instincts even when a situation does comes up. Odo would have had a plan. 1. Riker tells off the kid, revealing the details of the worrying prank incident and it's aftermath. 2. Senior crew discuss how to regain some control of the ship and get to Data to find out what's happening. I would like to take a moment to ask about the situation with these two kids. The younger is nine, the elder is like 13, but they are left on a starship while both parents go on sabbatical? Where have the parents even gone that this was the safer alternative? Are there no relatives or family friends who live in safe, settled places? Maybe these utopic Federation planets we never see. Riker agreed to this on the condition that the children behave themselves, as if saying that has ever made it happen. The prank went badly wrong, but even so the elder kid seems to need a certain level of supervision if this is what he does without it. Plus there no suggestion of punishment. I know he already feels bad but wouldn't a punishment help reinforce things and make his victim feel better? 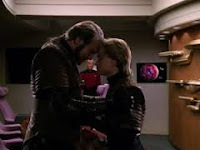 Riker's words suggest that the parents came to him with the idea of leaving their young sons behind, rather than being ordered away. I'm side-eyeing these people so hard. Was anyone else assigned to the boys' care? Are they staying with another family on the ship? Are there teachers/carers/guardians involved? Who knows? Troi seems to be minding the older kid, but is she just his liaison for official stuff? At first I thought they were playing in a holodeck, but if the younger one got an infectious parasite they must have been messing around on a planet. Do kids visit planets unattended? How often does this kind of thing happen? I mean Dr Crusher left Wesley on the Enterprise and it was never made clear who was actually responsible for him day-to-day, but at least Wesley was part of the crew structure and nearly an adult. Seriously Star Fleet is a child protection nightmare. Picard suggests separating the saucer section to Geordi, a rarity for him. Though given Wesley's shocked reaction doing this at warp is really risky. This doesn't have anything to do with preserving the vulnerable members of the community, they'd be stuck with Data. It's just a way for Picard to get control of part of the ship. The ship got to a medical facility in time and the boy is still quarantined but is recovering. Data watches as the young brothers play with dinosaur toys he brought from Dr Soong's rooms. Crusher tells Data that brothers forgive, Data considers this. Just in case you hadn't realised that the plotline with the two kids was a metaphor for Data and Lore.